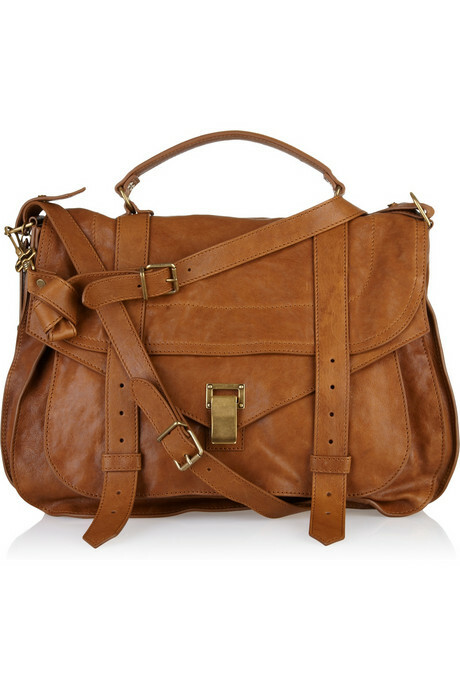 This absolute beauty is Proenza Schouler’s PS1 Extra Large leather travel bag. It is a caramel-brown leather travel bag with a top handle, a detachable knotted shoulder strap, a buckle-fastening cross-body strap, a fold-over flap front with a lock and strap fastening, pouch pockets at the front and back, an internal zip-fastening pocket, and it is fully lined. It retails for $2350 at CAD at NET-A-PORTER. Easy to find for under $20 right? This will be tough. I am writing to profess my utter delight in your designs and specifically one item in particular, the PS1 extra large leather travel bag (in Saddle). This beautiful work of art has inspired great feelings of fashion lust in me but alas, I am just a poor graduate student trying to survive a horrible recession that has left me in a stylistic rut. Unfortunately, my current meagre funds cannot afford me the luxury of purchasing your magnificent product therefore, I must try to appeal to your charitable natures. If you could be ever so kind as to donate one of your beautiful bags to my cause I will be forever grateful to you and will showcase your product everywhere I go. I will even shout about its glorious craftsmanship from the rooftops! If you cannot part with one of your prime specimens I will gladly offer to take one of its brothers or sisters with more “character” off your hands. Perhaps one that has been slightly damaged in the production process, or one that was tragically injured in a stocking or shipping accident? I am a woman with a lot of love to give and am fully committed to aiding in any bag-related rescue and rehabilitation. I thank you in advance for considering my most heartfelt request and I hope to someday coddle one of your wonderful creations. In the meantime I would like to apologize for attempting to find an alternative to your bag for under $20. Of course I could never find an article that truly embodies the glory of your product for such a small sum of money and I mean no offense or insult. I’ll keep all you readers updated on when my shipment arrives, lol. In the meantime the challenge is on!